Notes: Per full-benefit enrollee. MLTSS programs for seniors were in place in AZ, HI, MN, TN, VT, and WI. Because of the way the MLTSS data are categorized, we were unable to calculate reliable spending per enrollee estimates for these states. We were also unable to report spending for New Mexico, due to a spending data reliability issue for senior enrollees in the New Mexico CoLTS program. 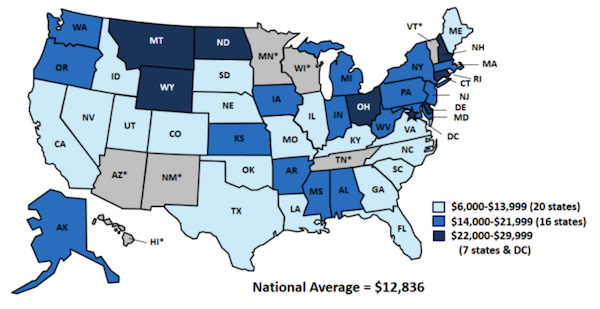 These states were withheld from the national spending per full-benefit senior enrollee calculation. Data Source: KCMU and Urban Institute estimataes based on data from FY 2011 MSIS and CMS-64 reports. Because 2011 data were unavailable, 2010 data was used for FL, KS, ME, MD, MT, NM, NJ, OK, TX, and UT. This entry was posted in Data Watch on August 17, 2016 by Christopher Barbey.